* Annual board meeting: The Friends of Prospect Park held their annual board meeting on March 18th. Long-serving vice president Dorothy Perkins stepped down and Charles Kilgore became the Friends new vice president. The Friends offer their grateful thanks to both. Also, the old garden of the Whittall estate has finally been cleared enough so that some replanting of the garden can begin. The Friends are seeking someone with gardening experience to suggest a planting scheme. 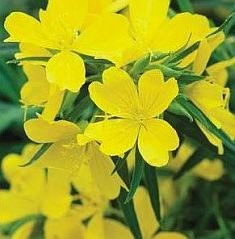 * Spring flowers: After a brutally cold winter that was accompanied by record snowfalls, it's a relief to see flowers blooming again. In early May, banks of forsythia are in blossom along Prospect Street. Daffodils are in blossom at the park's entrance. 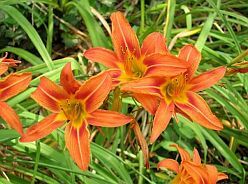 The flowers were planted there last fall by the Shrewsbury Garden Club's Junior members. Daffodils of several varieties are also sprouting throughout the woods. 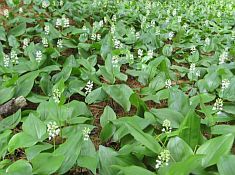 As the weather warms, the forest floor is carpeted with the white flowers of Canadian mayflower (Maianthemum canadense, below left) and Lily of the valley (Convallaria majalis, below right). 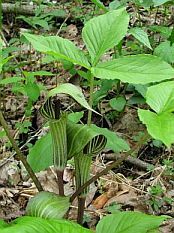 By mid-May, jack-in-the-pulpits (Arisaema triphyllum, below left) and Solomon's seal (Polygonatum biflorum, below right) are in bloom. 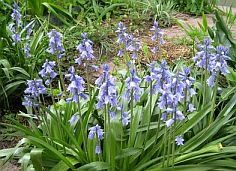 During the third week of May, blue and white Spanish bluebells (Hyacinthoides hispanica, below left) bloom in the Garden of Remembrance. 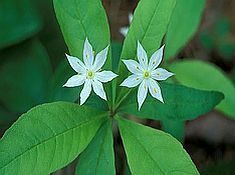 Little Starflowers (Trientalis borealis, below right) are scattered through the woods. As May comes to an end, comfrey (Symphytum officinale, below left) and blue flag irises (Iris versicolor, below center) blossom in the Garden, while wild geranium (Geranium maculatum, below right) blooms along the trails. 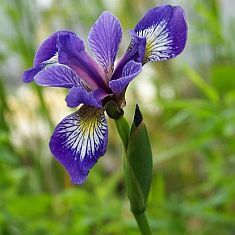 * Shrewsbury Garden Club: The Shrewsbury Garden Club donated a large number of perennials to the Friends: daylilies, evening primrose, forget-me-not, bachelor button, false indigo, "Autumn Joy" sedum, ornamental grasses, and many more. The Friends are deeply grateful to the Garden Club for its generous gift. 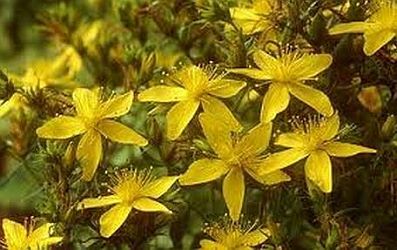 By mid June, St. John's wort (Hypericum perforatum, below left) and daisy fleabane (Erigeron strigosus, below right) are in blossom. Shortly after the summer solstice, evening primrose (Oenothera biennis, below left) and daylilies (Hemerocallis fulva, below right) make their appearance. Now the Garden resembles an Impressionist painting of a meadow, flecked with little purple, white, and yellow flowers. 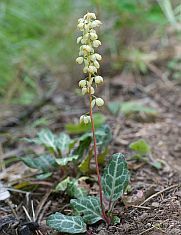 As June comes to a close, white-veined wintergreen (Pyrola picta) blooms shyly in the woods. 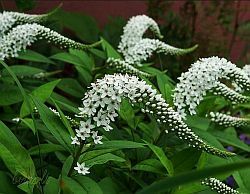 As July opens, gooseneck loosestrife (Lysimachia clethroides, below left), black-eyed Susans (Rudbeckia hirta, below center), and Deptford pink (Dianthus armeria, below right) begin to blossom in the Garden. In early August, a yucca plant (Yucca filamentosa, below left) bloomed. 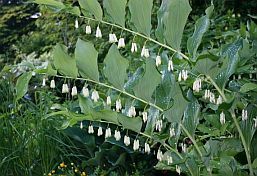 It had been planed years earlier by local resident Cathy Otoole; however, it grew in partial shade, so it wasn't until this year that it finally flowered. Many years ago, yuccas were also planted along the driveway leading from the parking lot to the summit, but because the driveway is heavily shaded, those yuccas never blossom. 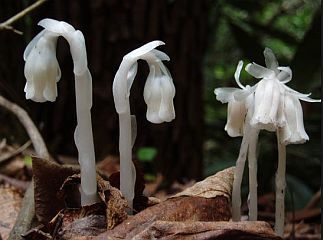 By mid August, Indian pipe (Monotropa uniflora, below center) sprouts and flowers in shady locations. It's not a mushroom. 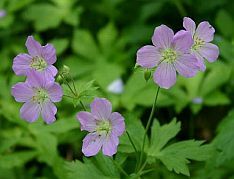 It's a flower that has no green chlorophyll; it's fed by fungi, which in turn are fed by trees. As August closes, wild hydrangea (Hydrangea arborescens, below right) flowers. It's a large shrub. 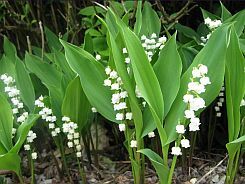 The actual flowers are tiny; the large white "petals" are actually colored leaves ("bracts"). * Trail signs: Also during August, two trail signs -- one for the Juniper trail and another for the Meeting House Hill trail -- were installed in the park. The signs' steel frames were fabricated by local resident Steve Stillman. Mr. Stillman and Chris Kirk installed the signs. 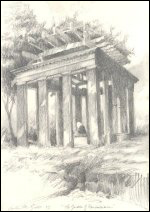 The Friends are grateful to Mr. Stillman for his efforts on behalf of the park's visitors. * Work day: On September 12, there was a work day at the park. 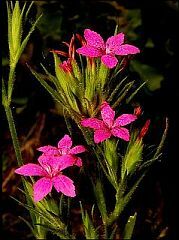 The flower beds were weeded, wood chips were spread on the Juniper trail, poison ivy along the trails was sprayed, a trail was cleared, and litter collected. The Friends thank Lon and Martha Maletta, Melanie McGee, Marcia Pereira, Jim Palmer, Chuck Kilgore, Don Gross, and Chris Kirk for volunteering their help. 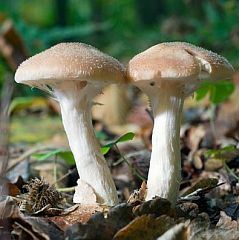 * Mushroom hunt: A mushroom hunt was held in the park on September 13. Interest in gathering wild mushrooms must be keen in Shrewsbury because the hunt was oversubscribed. 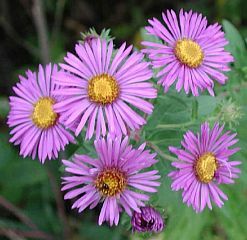 The arrival of autumn is announced by the blossoms of the New England aster (Symphyotrichum novae-angliae).